Deputy Health Minister makes clear he will not sit in a coalition with the former chief of staff and Yesh Atid chairman. 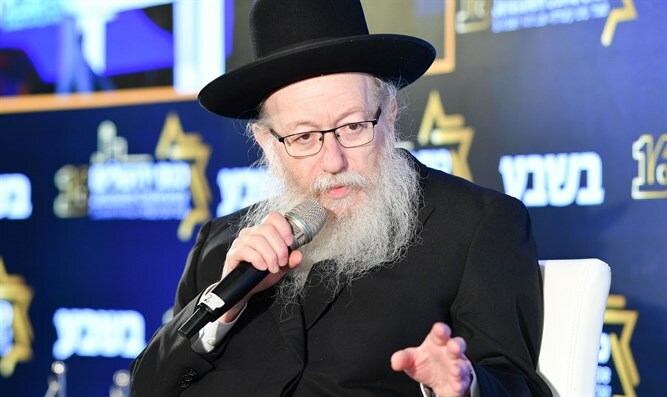 Deputy Health Minister MK Yaakov Litzman (United Torah Judaism) made clear on Monday that he will not sit in a joint coalition with former chief of staff Benny Gantz and Yesh Atid chairman Yair Lapid. "I will not sit in a joint government of Gantz and Lapid and I say that unequivocally," Litzman said at the 16th Jerusalem Conference. Litzman also discussed the idea of ​​an alliance between United Torah Judaism and Shas, which taken off from the agenda after Shas chairman Aryeh Deri announced that the merger of the two lists was out of the question. "The truth is that we did a union with Degel Hatorah and that's a great union. Maybe they (Shas) do not want to run with us, and I'm not supposed to explain them. When the idea came up, I asked my rabbis and came back with a positive answer, so it did not come from our side," he said. Litzman criticized Benny Gantz but distinguished him from Lapid. "I do not like much of what he says, but that's what politicians talk about before elections. However, Lapid during his tenure as finance minister hurt and looted the haredi public."